Over the last few months I've been surveying bird populations in some of the reserves in the Clarence City Council area ('Clarence' lies on the eastern shore of the Derwent River 'opposite' Hobart). I'm quite well acquainted with most of these reserves, but one seems to have 'escaped' me--Pilcher's Hill at Gielston Bay. I had made a fleeting visit a year or so ago, in light drizzle, and my first impressions weren't good. It lies close to a fairly recent housing development for one, and has been the dumping ground for building and garden 'refuse' and is criss-crossed by multiple bulldozed tracks and, if that wasn't enough, it is still recovering from a major bushfire of a few years ago. Doesn't sound too good so far! So without a great deal of 'conviction', I undertook two surveys one each in October and November. Both early morning and lasting a few hours on each visit. So the surprising result was that I recorded a total of 44 species not counting 'overflyers' such as Kelp Gulls. To this total, I consider other species that are probably present, especially closer to the hills of the Meehan Range, or casual visitors (e.g. Yellow-tailed Black Cockatoo and raptor species), may total an additional 16. The only raptor seen, and on several occasions, was a male Brown Goshawk, which I'm sure is breeding here. In the Tasmanian context that puts this reserve, in species terms, among the best. Finding only 6 of the Tasmanian endemics was a little disappointing, but a search in the wetter areas nearer the Meehan range will probable show the presence of both Tasmanian Thornbill and Scrubwren--awaiting further surveys. It's worth commenting here that most of the 44 species seen in this reserve, are breeding here too. 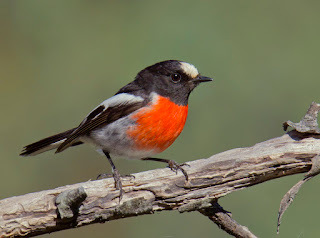 Dusky, Flame and Scarlet Robins were recorded, with the former present in considerable numbers, largely in the bushfire damaged regrowth areas. In fact I can't recall ever seeing the numbers of Dusky Robins that were present here, anywhere, quite remarkable. Both Bronzewing Pigeon species are present, and finding 5 Brush Bronzewings on a track in open, dry scrub, was an interesting sighting. Of the summer migrants, Satin Flycatchers were the stand out, with one or more pairs heard calling in most wooded valleys. Three of the four cuckoos were present, with only the Horsfield's Bronze-Cuckoo absent--I have only 2 spring records this year. A few Black-faced Cuckoo-shrike and Dusky Woodswallows were also seen, but numbers of the latter seem to be well down on 'usual' numbers in many areas. Surprisingly (and with some feeling of relief! ), I have yet to record Australian Magpie or Noisy Miners in the reserve, but that could easily change if large trees were removed, as they have in my suburb (Bellerive)-- many bush species that were once regular visitors to my garden are now only a distant memory. So if you're looking for fresh fields to explore, you might consider a visit to this reserve. I would be interested in your observations. NB. The accompanying images were taken during the surveys. 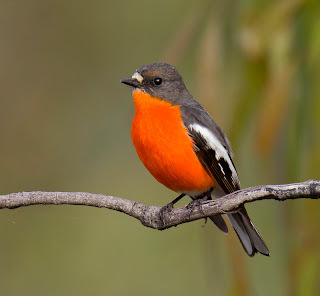 to see the robins and satin flycatcher like you did would be very special. There are big colonies of the noisy miners here who stalk with a vengeance any new bird presence unfortunately. I wouldn't mind swapping the miners for some of the smaller birds i.e. finches, thornbills, wrens etc. Thank you for your comments. I think my timing was pretty good as far as seeing/photographing the "Satins" as they were very territorial and nest building. I agree with your comments about the Noisy Miners. They became regular summer visitors to my area a few years ago--they had only been occasional winter visitors before--and now are almost permanent residents. They're usually always in numbers and chase anything that moves! Not easy to deter. I'm a regular visitor to Risdon Brook Dam, and have noted what seems to me to be normal numbers (for this time of year) of Dusky Woodswallows currently out there, including a number of nesting pairs. I've also had some residents around Natone Hill note a greater current presence of Dusky Woodswallows, compared to the same time last year. 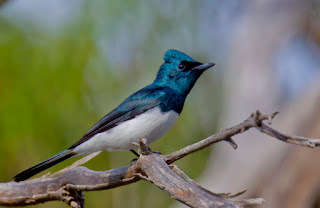 I did see Duskywoodswallows in this reserve during my surveys. Your excursions are conducted in september I believe, which is a little early for most summer migrants. In many areas that I bird, DWS numbers are down. However, in my experience, it's not unusual for numbers to fluctuate from year to year and in their breeding distribution. I don't think this is an indication that we should be concerned.